Venue owners and managers - Are you legal? Many owners and managers of bars and venues with in-house security are unaware that they may be operating illegally, under the Private Security Industry Act 2001. Under the Act, any person employing, managing or supervising door supervisors must hold at least a Non-Front Line Security Industry Authority License. Failure to comply with this requirement could render that person liable to up to six months imprisonment and a £5,000 fine. In addition, all door supervisors (whether employed or self-employed) must hold and display a valid SIA License. Police and local councils carry out random inspections of licensed premises. In June last year, inspections in Maidenhead found a door supervisor working with a revoked license and a bar owner without the correct license. Earlier this year in Sheffield an inspection found a bar manager who did not hold the correct Non-Front Line SIA Licence required to deploy in-house door supervisors at his venue. It's your responsibility to check these things. To find out more, you can read the PSIA 2001. Alternatively, why not just call Gardant to discuss your door supervision requirements. 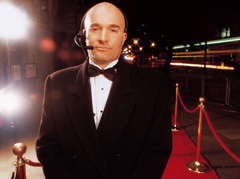 Our team is 100% SIA-licensed and all our door supervisors are carefully screened. Call Oliver Backhouse on 07403 868687 for a free, no obligation consultation.